am I just getting clumsier? Or more careless? Or is it because I am old? I spent 6 hours of a beautiful Saturday afternoon first at the Holy Cross Urgent Care on South Federal and then the ER at the Holy Cross on North Federal. Okay it all started Wednesday when I stopped in a gas station to fill up the rear right passenger side of Allen's car as it said 'low pressure 27'--as I put the hose to the tire and started to fill it some debris flew up and I felt something go in my eye. On Thursday getting up from my computer I had forgotten to close one of the draws and banged my right shin into it. I washed my eye out and put a cold compress on my leg. 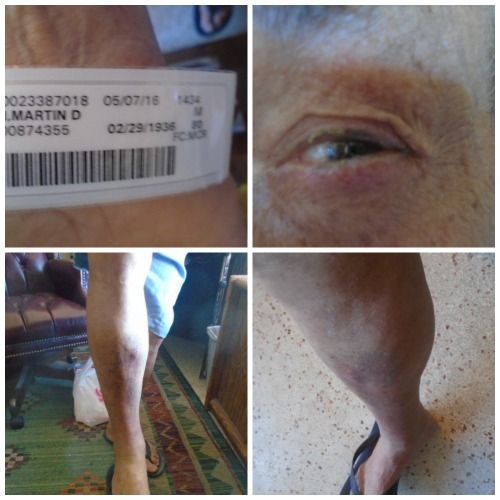 Long story short--after calling doctor (he was off Friday) and insurance the latter suggested I go to the new Holy Cross Urgent Center today as the calf was getting more swollen and the eye was 'glued closed' when I woke up. Was surprised there was only 2 patients there but was happy as it meant I won't get in and out--and I did AFTER the Doctor said she would give me a prescription for the eye as it was infected BUT also said I would have to go to the HC ER to get an ultra sound as it being Saturday they technician wasn't there. She wrote there was a hematoma that was getting bigger and because my last (10 days ago) INR count was 5.0 (should be between 2.5-3.5) and I have to go the ER to get an ultra sound and further evaluation so off I went!! Doctor (a different one) came in and said she doesn't think an ultra sound is necessary--an hour later she said I should go home, put my leg up with a cold compress. PS I forgot—I was also diagnosed with bursitis on my right elbow!!! PPS Allen gets back today from France so after 3 weeks with a car I am a prisoner again!